On my last trip to Thailand I spent a total of two months straight in South East Asia, only a month of that actually in Thailand. This was during the first 3 months of 2005, arriving only two weeks after the Tsunami hit. As I traveled I would send an email home to friends and family every two weeks, just to let them know I was still alive and stuff. This email was my very last, and best, of all 5 I sent. The first two paragraphs are a highly abridged list of things I did. The last section, however, I feel best explains why people like me enjoy traveling countries like Thailand. So a quick overview of my last 2 weeks in Thailand. I had only stayed in Bangkok a few days before I just had to go out and explore some more. First to Pattaya, probably the largest bar and brothel I have ever seen in my life. It had a really nice mountain view of the city, but the beaches were fairly bad. There was also this place called Mini Siam, basically a field of miniaturized world landmarks. 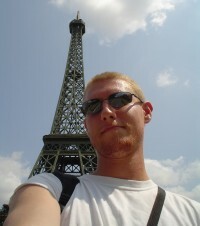 I got a few pics that at the right angle makes me look like I am in New York or France. So I got bored there after one day and night, then traveled through Bangkok to Lopburi. On the bus trip I spoke with this Britian who also likes traveling asia and he told me about how good an idea of renting a motorbike is. I had already considered it, but I was too afraid after seeing Bangkok traffic. So about Lopburi, this place is a city built around ancient ruins. The ruins being infested with monkies of course. I kept filming the monkies playing on the power lines with the hope something 'interesting' would happen. Cough. 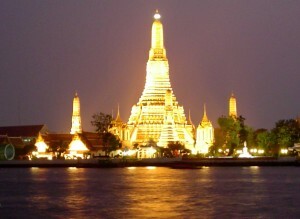 So after one day and night I got bored, passed through Bangkok again, and headed to Hua Hin. And of course on that bus trip I spoke with a monk in Thai on the way. I asked him what it would take to be a monk for a day or two, and I changed my mind after he said I had to shave my eyebrows . . . So Hua Hin wasn't that exciting. Temples and mountains and a concert. But I met a bunch of nice people who couldnt speak english who fed me food and drove me around for my company and enjoyed my attempts at speaking Thai. After only a day in Hua Hin, I headed to Koh Samui which requires a long bus ride and ferry boat. So I was off to meet Oui again, the penpal who I traveled with for almost 2 weeks from Phuket during my early adventures. Unfortunatly she works so I got little chat time in, but Koh Samui was fun anyways. She introduced me to a Britian and a Canadian, who both convinced me to rent out a motorbike. Public transportation was 3x more expensive so it was an easy decision. The traffic there was extremely safe (compared to Bangkok), and the roads simple too. Unfortunatly the roads were too simple, and I kept getting lost due to the lack of landmarks. Driving the bike was too much fun. It was like freedom to go anywhere. I went to several waterfalls and hiked a mountain forest trail. I drove down to this beach, and within 5 seconds on walking on the sand I already had Thai people waving me over to chat. Its so much easier talking to people who dont speak english when you speak their language =P They showed me around the beach, and then I drove them to work. Yea, I drove 3 adult Thai girls on a motorbike simultaneously. I used to think 4 people on a motorbike was insane . . . o well. It wasn't until the next day did I have my first motorbike accident. I was breaking too fast on the side of the road, and I lost control with all the dirt and sand there. The bike fell over, and I ended up with bad scrapes on my right arm, hand, and leg. Fortunatly my friend Lek, who was riding with me, fell on me so she only had a leg bruising. The bike damages came out to about $25US . . . a lot of money in Thailand. That night I stayed with Lek's friends . . . 5 other bar girls. Yea dont ask. They were nice. In general I really liked Koh Samui, and have no regrets about the motorbike. O and I forgot to mention, I met this german guy who can speak Thai as well as me. My first real conversation in Thai, as we both spoke at the same speed and level, and didnt have any crazy Thai dialects. If only I could have known him longer, it would be nice to have a friend to learn Thai with instead of always on my own. We both can SPEAK Thai fluently, but when we hear Thai's speak at normal speed, we understand very little. He blames it on the dialects, and at times I do too. But in all honesty I think I just need more practice to build up speed. Anyways I spent my last 3 days in Bangkok exploring, and I am starting to like the city. So this is my last email from my big adventure. People have way too often asked why I would ever travel to asia and do the things I have done. 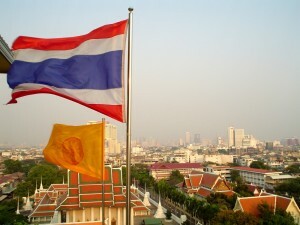 Why learn Thai? Why not go to Europe instead? Are you going there just to pick up asian girls? It is understandable why people from developing and 3rd world nations would go to the US and Europe for a better life, but the opposite is much less understandable for people. Why would I go from the land of plenty to the land of less? The many travelers whom I have met would understand why, but those who have never traveled would have difficulty understanding. Its the feeling I got when seeing thousands of bats in a cave in Khao Sok, its what I saw when I traveled to tsunami devasted Khao Lak, its the surpise I had when seeing 40 monkies come out of the woods and pass by me, or when I saw a kamodo dragon right next to me. Its when I was chased by two hungry giant malaysian monitor lizards, or attempting conversation in Indonesian with the fishing villagers, and even the motorcycle accident. And even more, its the many friends I have made, and their kindness unparalleled. These things just can't happen in any everyday life in Pittsburgh or New Orleans, its the excitement of waking up in a new place everyday, knowing new adventures are literally right outside to be had. What is less understandable for me is why many people would spend decades of a less exciting life of work/school and think that going out to dinner and seeing a movie is a highlight of life. Not that I dont like going out to eat, its just not exciting to me. I know I have always been somewhat vague and unclear whenever I am asked about my traveling decision, but it was more because it is very difficult to rationalize the seeking of emotions . . . that little yearning inside of me to get out and be a little crazy and enjoy my youth. I know, now that I am returning to a more 'normal' life of work and robots again, I am never going to be able to just enjoy what I have. I am always going to be dreaming of my next adventure, my next trip to mystery land. And I hope, that with all my stories and pics, at least 3 or 4 of you on my email list will not only want to go on an adventure, but would actually go on one. Either with me next year, or on your own. I am always there for advice if you want to take that first step. And yes, I am planning a new trip. Either from Mexico to Chile, or from Shanghai China to Portugal. Havent decided yet. But first my normal life, paying off tuition, paying the bills, paying for food - and saving up again to travel. So where am I right now? Well I went broke, and I returned to Pittsburgh. I was never able to find a job good enough to survive on and also pay off tuition in Thailand. I have also been rejected for graduate school at CMU. So for now I am going to stay in Pittsburgh until I finish this robot I have been working on for almost a year now. I will stay for a month, and then figure out what I will do from there. I got many reply emails after I sent this to everyone, and below is one particular email from a friend who I really think hits home . . . She also likes France as much as I like Thailand if not more so . . .
"I wanted to cry a bit in your ending because it is very nicely done. It's sort of well.. perhaps we don't see things the same way, and don't actually agree but you know that feeling you are talking about? that whole you're in a new place and you can explore and have no idea what's going to happen in a good way? well, I understand. Experiencing a voyage does not make it any less valuable whether you went to Scotland or Indonesia but it's the quality, I find, of the person that voyages, and what this person brings into it and is willing to give to it that makes that voyage worth it. I'm sure you know some people that would have thrown the towel and checked into the first holiday inn they saw. I am glad you didn't. And I am glad this changed you and broadened you. What's the world for, then, if not for that? That eiffel tower pix is hilarious... but don't ever do that if you go to the real thing."